By JULIA PRITCHARD FOR MAILONLINE In a video obtained by TMZ, the singer, 76, is seen dancing excitedly onstage as he croons out some of the band’s biggest hits for guests at the nuptials of his wife Nancy Shevell’s nephew. The video shows Paul taking to the stage at the Fresh Meadow Country Club in Long Island, in front of 300 family members and friends. Keen to get the party started, the singer, clad in a white shirt and loosened tie, immediately breaks into a rendition of I Saw Her Standing There, to the delight of the bride and groom. Accompanied by the wedding’s 20-piece band, Paul is seen bopping and belting his heart out onstage, as guests jump up and down with excitement while the happy couple dance beside him. 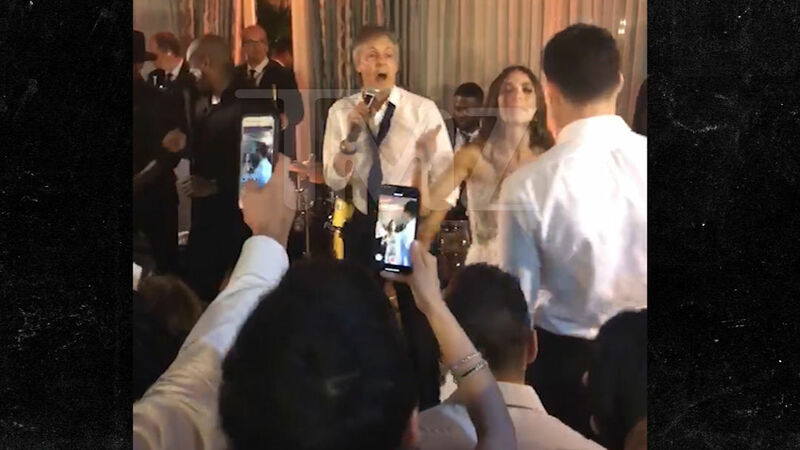 If Paul McCartney ever gets tired of selling out stadiums, he’s got a career as a wedding singer, which he proved when he grabbed the mic over the weekend at his nephew’s nuptials. The groom is believed to be the nephew of his wife Nancy Shevell, meaning the pair were no doubt joined by several family members. Paul and Nancy first started dating in 2007, and tied the knot in a romantic ceremony at Old Marylebone Town Hall in London, four years later. Still going strong over ten years later, the musician was quick to gush about his wife during an episode of Australia’s 60 Minutes in June 2017.